NOTE: This post was originally published on WallarooMedia.com. To learn more about Snapchat marketing strategy, check them out! Snapchat is blowing up right now. Leaked documents just revealed that they have 110 million daily active users. And these users are HIGHLY engaged. Most users consume every post they see. Humans only have enough time to dedicate to 5-7 apps a day, and Snapchat is quickly rising to the top. To stand out on Snap, you must be fun, creative, and engaging. To help get you started, here are twelve creative Snapchat campaigns from different brands to inspire your strategy! The filter performed extremely well. It was viewed 224 Million times. That’s an absolutely incredible number. They paid an estimated $750,000 for 24 hours of that filter. That works out to be 0.3 cents per view. Not three cents. Three tenths of one cent! That’s insane. It paid off though. 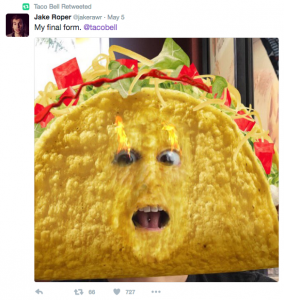 People thoroughly enjoyed playing with the filter and it surely helped increase Taco Bell’s sales. X-Men did a massive takeover on May 23, to help promote the release of the new X-Men: Apocalypse movie. They didn’t just create one sponsored filter, they created ALL of them. 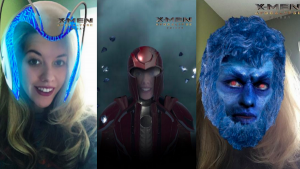 Every filter, for the entire day on Snapchat, was related to X-Men. Analytics haven’t been released yet, but if their numbers mirror those of Taco Bell, they would have received around 1.5 Billion views! Working with influencers on Snapchat is a must. They know their followers best and can often help your brand create fun, engaging content that delivers results. 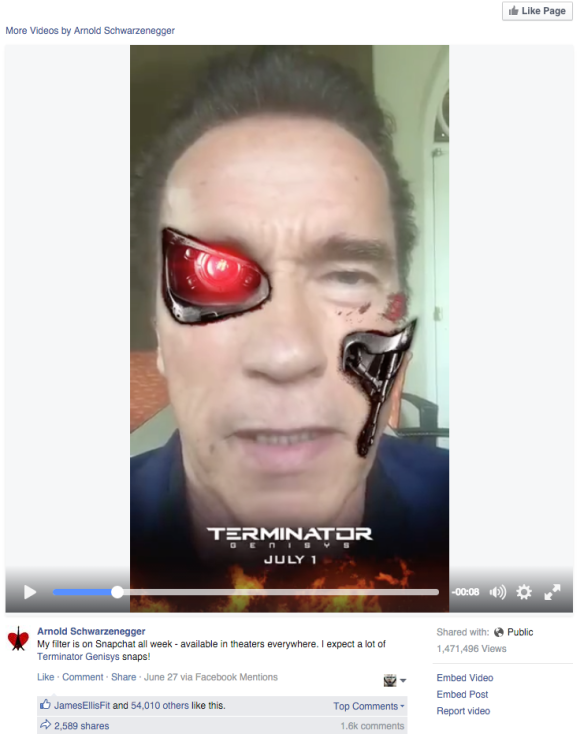 To promote the release of the new Terminator movie last year, a custom filter was created. Users were able to overlay the filter onto themselves or their pets. Smartly, Arnold Schwarzenegger also promoted this on Facebook. His Facebook post about the custom Snapchat filter received 3,000 shares and 55,000 likes. Cross-promoting onto other platforms is a good way to increase your organic reach with not much extra effort. During the 2015 VMAs, MTV did a Live Story on Snapchat. This allowed anyone in the area to post pictures and videos to that Live Story, for all to see. Celebrities and audience members shared hilarious behind-the-scenes footage onto the story. About 10 million people tuned in to watch the VMAs on TV, and about 12 million people viewed the story on Snapchat! And at a much cheaper production cost. Mondelez makes delectable candy bars. To increase brand awareness and sales, they created a competition on Snapchat. 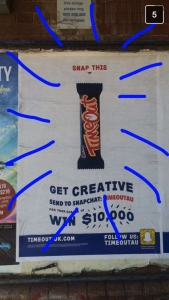 To enter the contest you had to snap a photo of their chocolate bar, modify it using Snapchat’s drawing tools, and send it to the TIMEOUTAU Snapchat account. The winner of the competition won $10,000! Mondelez also showcased some of the best creations on a website. Mondelez’s idea to create a microsite to enhance the competition was a great way to increase awareness and increase customer loyalty (and product sales). GrubHub is a cool online food ordering company. 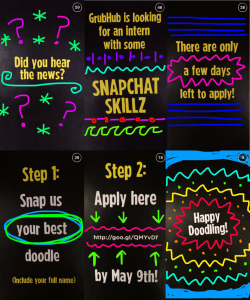 They used Snapchat to look for an intern with “Snapchat Skillz”. They used the image sequence below to recruit applicants to grow their company. Very creative! To create some extra hype for their Spring 2016 Fashion Show, Burberry revealed their newest line of clothes through a series of snaps. They also produced pictures and videos featuring their designers and models. They also live-snapped the actual show, piggybacking off the hype they previously created. MLS dedicated an entire week to Snapchat takeovers. A “takeover” is when someone else takes over and runs your Snapchat account. So each day, MLS handed over their account to a new soccer star. The stars promoted this on their own accounts leading up to their turn, and then created fun, engaging content on the MLS account on their day. Takeovers are a great way to build your Snapchat following. 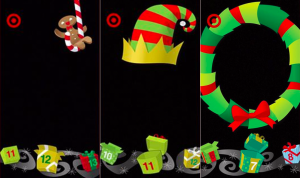 Target has been using geofilters around different holiday events. They target these geofilters around their physical stores to help increase brand awareness and sales. This is an easy, fun campaign idea that any brand can use to succeed on Snapchat. Have any questions? Tweet me! Want custom Snapchat geofilters for your company? Contact us today!